I have loved Cisco brews from my first tasting on tap at Bin 71, the first of the trendy wine bars that have stolen the smaller retail spaces in the neighborhood. What Cisco (hailing from that isle of Limerick fame) says that they are brewing…well, it twists away from expectations. This IPA is fresh, fresh like digging a spork into the ripe flesh of grapefruit for breakfast. It’s color runs a beautiful tanned rose. And the taste…there is something elusive in their formula, suggestive like the middle ocean’s horizon, or perhaps a call that runs the true, deep waters. To accompany the beer, I have discovered a true Ahab of the one-a-day beer blog. This guy is a spirited maniac, comfortable with driving a whole crew with him in search of the great white ale. Check out Lost in the Beer Aisle under the One-A-Day links. 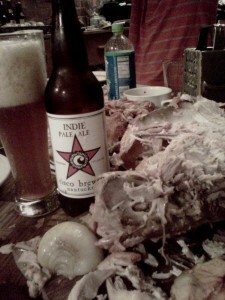 This entry was posted in Best Brews, IPA and tagged ahab, melville, nantucket, ocean, whales, whaling. Bookmark the permalink.